The perfect venue for a variety of uses!! Designed to cater for a wide variety of of uses, Unit 3 is available for private hire functions at surprisingly competitive prices. Featuring a large 14m x 9m dance floor and a professional sound, vision and light system, unit 3 is perfect for any occasion. 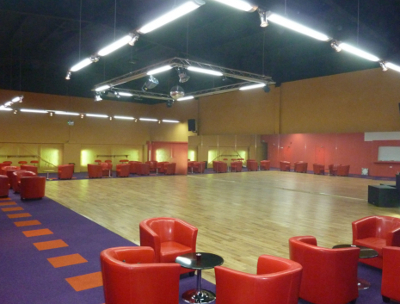 Comfortable seating, a kitchen and serving area help to provide a truly flexible space so whether you are looking for somewhere to host a family party, hold a business presentation, or run a dance class, our staff can help you to achieve a successful event. Bring your own food or hire a caterer it's up to you. Hire a DJ or use our extensive music library to host your own 'do'. We can help you. Unit 3 is located next door to Jungle Jungle on Lufton Trading Estate and we welcome visitors at any time to come and see what we can offer. We welcome all enquiries - please contact us today!